← Why Does Your Score Go Up In Competition? Fall golf in New England is beautiful. The golf course gets green again, the colors surrounding the fairways are vibrant and bursting with oranges, reds and yellows. It is my favorite time of year to play golf. Yes, it is true, the fall foliage indicates the golf season is coming to a close up here but that doesn’t mean the time we have left can’t be meaningful AND fun! You’ve played golf all season, perhaps taken some lessons and worked on your game and even lowered your handicap! Why not go out and put your seasoned skills to a different challenge, one that offers the opportunity for a little fun and creativity! My favorite thing to do this time of year is to grab my super small carry bag, throw 4 clubs in it and head for the first tee. Ahh….the freedom of it all! Believe it or not, you take the pressure off yourself because you have a limited number of clubs to choose from therefore, you have to make different shots. So, why does it take the pressure off you ask? Here’s an example. 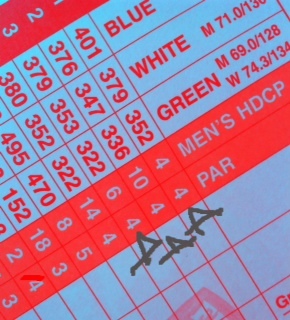 When I ventured into my fall 4 club round, my club selection included a 3 hybrid, 7 iron, 52 degree wedge and a putter. 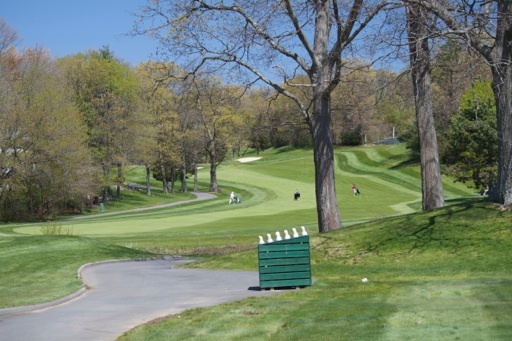 The first hole at my club is a challenging sneaky up hill par 4 that always plays longer than the yardage on the card. There’s water on the right and a fairway bunker on the left. The green is well guarded with bunkers all around and it is almost always into the wind! Normally, I would use my driver off the tee in order to have a chance at getting to the green in two shots. Now, with my limited club selection, I had to use my 3 hybrid. With no pressure to “bomb” it off the tee and knowing that I’ll very likely arrive at the green in three shots rather than two, I hit a smooth 3 hybrid that landed in the middle of the fairway. The next club to have a turn was the seven iron. That shot landed in front of the green. I followed it up with a pitch shot using the 52 degree wedge and the ball found it’s way right up onto the green! So go ahead, the next time you go out to play 9 holes, grab four clubs, a lightweight carry bag some balls and a few tees. It’s a nice walk on the course (the bag gets really light with only four clubs!) and shot creativity rises to the top when you play with a limited number of clubs. You’ll be surprised at how enjoyable it is to try different shots on the course, especially if it is a course you play on a regular basis. You might even be pleasantly surprised at your score! This entry was posted in Articles and tagged Attitude, cathy macpherson, Cathy MacPherson Golf, Creative Shot Making, Fall Golf, Fall Golf In New England, four club golf, Golf Instruction, Golf Instruction Boston, lightweight carry bag, lpga professional, Shot Making, Three Club Golf, Top 50 Teacher. Bookmark the permalink. 1 Response to Fall Golf…Free It Up A Bit And Make It Fun!